The second, more elaborate, version from this box. The first is here. Cream well. Add ingredients and beat to a smooth batter. Bake in layer in moderate oven, 15 to 20 minutes. Save egg white for icing. Melt chocolate, add cream and egg yolk. Mix in sugar. Add cornstarch which has been mixed with a little cold water and cook until smooth and thick. Add salt and vanilla. Spread between layers. Melt chocolate. Put egg white in shallow dish. Add sugar while beating. Add butter, melted chocolate and cream. Beat well until right consistency to spread. 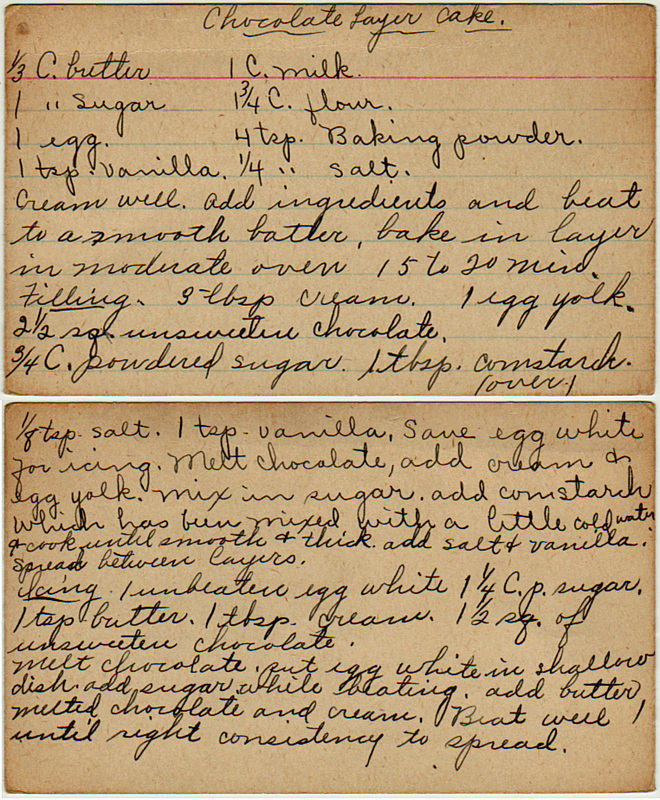 For a discussion of the history of energy bars, see the other recipe from this box, Clara’s energy bars.